As data journalism rises, sensors will become a vital device for collecting, sifting through and interpreting data that journalists haven't had access to before. Photo by Intel Free Press on Flickr and used here with Creative Commons license. No one can deny the ubiquitous nature of sensors. They are everywhere (even when we’re not aware of them), whether in the form of radar trackers, satellite imagery, biochips or drones. Simultaneously, the popularity of data journalism is rising and sensors will become a vital device for collecting, sifting through and interpreting data that journalists (and audiences) have never seen before. That’s the message from Fergus Pitt and other professional journalists, academics and technologists who authored “Sensors and Journalism,” a recently released report from the Tow Center for Digital Journalism. "Pitt’s report is a rich document that should be required reading for newsroom journalists exploring the potential uses, pitfalls and ethical implications of sensor journalism." As the University of Nebraska Drone Journalism Lab’s Matt Waite wrote in a story for Poynter last year, in an age where we can glean unique information and characteristics about the world around us — such as light, heat, sound, pressure, air quality and others — sensors can and should be channeled to help tell our stories. But, in order for sensor journalism to grow, journalists need clearer definitions and guidelines on how to do it effectively and ethically. Even as sensing becomes more prevalent, it can be difficult to pin down a simple definition for this type of journalism for broadcast or even multimedia journalism, Pitts wrote. He said we should note that while sensor journalism may take on a different identity than other reporting, it should be approached the same way — ethically and skillfully. Charles Berret, a Ph.D. candidate at Columbia University and co-author of the Tow report, defined sensors as tools that “enable us to investigate what we simply cannot see, hear or touch. These instruments have quite literally provided us with new senses, and they are, as a result, the most difficult to scrutinize,” he wrote. The Tow Center team also wanted to learn what specifically journalists want to do with sensors. They found during a 2013 Tow Center workshop that there was a hunger among newsroom reporters and researchers to use more fresh data in their reporting. “[Environmental reporters] wanted data with better spatial coverage — often targeted where they expected to find problems but couldn’t be sure. Pollution monitoring near industrial facilities was the most common example,” the report reads. Additionally, journalists are looking to “take human observations and impressions and make them specific, so that they might be used for comparisons,” Pitt wrote. Using sensors can contextualize contrasts between vehicle speed and the corresponding law, or even number of gunshots heard in one urban neighborhood over another. An important aspect of Pitt’s work is the three themes he noticed during his research of newsroom sensor usage. First, he wrote, sensor journalism involves the surrounding community; second, journalists using sensors to gather data were, and should be, prepared for trial-and-error processes; and third, the reporters working with sensors combined traditional reporting and writing measures with sensor journalism to add color to the data. Sensor journalism is not performed in a vacuum; it is only one tool journalists can utilize alongside conventional research and interviewing strategies. In fact, it’s the most effective when employed in conjunction with other reporting methods. Pitt describes how just a few various newsrooms used sensors to build a framework around certain data-driven stories. Former Houston Chronicle environmental reporter (now covering national environmental issues for the AP) Dina Cappiello set out to expose the magnitude of chemical rainfall in South Texas and the state’s weak zoning laws outlining distance required between homeowners’ properties and oil refineries. Realizing that she didn’t have any clear evidence to bolster her reporting, but rather, anecdotes from residents about nosebleeds and polluted air, Cappiello looked to sensors — chemical monitoring badges called Organic Vapor Monitors — to measure the types of toxins being emitted from Houston’s petrochemical facilities. She also recruited neighborhood dwellers to hang the badges from trees and awnings for a three-day test period so the Chronicle could finally send off the monitors and get a reading on the types of potentially cancer-causing chemicals found in this area of Houston. Though some scientists have criticized this method, saying it lacked data on indoor air quality, Cappiello and the Chronicle have opened a door for sensor journalism in America and sparked ongoing discussions about air quality in Texas. Washington Post used data from the audio sensors on ShotSpotter to produce a story highlighting which Washington, D.C. neighborhoods experienced gunshots most frequently. In another case, Sally Kestin and John Maines from Fort Lauderdale’s Sun Sentinel isolated data from the state’s turnpike entity, Sun Pass, including time stamps and vehicle transponder IDs, to disclose to the public a “culture of police disregard.” After readers had complained for months about speeding police officers — and some who caused accidents and went virtually unpunished — the reporters gathered the sensor-produced data and created a Microsoft Access algorithm to calculate each time a police vehicle broke speed limits. The reporting earned the investigative writers a Pulitzer Prize, lowered the rate of speeding police by 84 percent and gave credence to what was previously a mere public observation. At the Washington Post, David Fallis relied upon an audio sensor program called ShotSpotter, which detects gunshots via its microphones fixed on rooftops and near city surveillance cameras. “When a microphone hears a likely match, it activates a recorder that saves the sounds and sends the data back to the D.C. Metropolitan Police Department’s centralized control system,” wrote Pitts. Essentially, it’s a simpler way for D.C. police to learn about gunfire incidents without having to rely on 911 phone calls. Fallis and a group of reporters at the Post ultimately produced a story ripe with multimedia components, including maps and audio clips, explaining how the occurrence of gunshots had lowered in Washington, D.C. in recent years and highlighting which neighborhoods experienced them most frequently. They also used ShotSpotter to draw a distinction between bona fide gunpowder and fireworks in their reporting. New tools can’t be successful without guidelines, and the use of these sensor devices will not be respected by the public without appropriate restrictions, the Tow Center report found. Nabiha Syed, a visiting fellow at Information Society Project Fellow at Yale Law School, predicts that consent may be an important aspect of sensor usage. 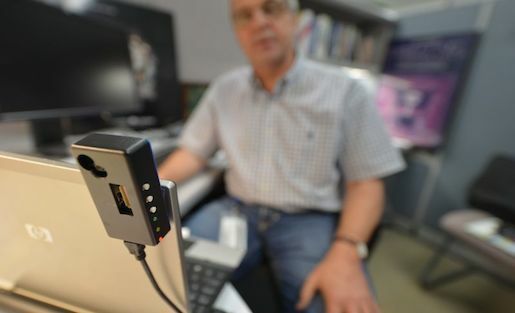 Consent can offer advance notice when sensors will be used, which could mean that legally, the images captured by a sensor could be no different from what a human witness might observe, making those images usable without penalty. Pointing to geo-tagging apps like Banjo and Fitbit that allow personal tracking and data curation, associate professor in the University of Wisconsin-Madison School of Journalism & Mass Communication Kathleen Culver (the editor of MediaShift’s EdShift section) said in the report journalists must “ask questions about why we collect data, who controls this data and what means will effectively empower individuals without subverting newsgathering.” It is the media industry’s, and governing entities’, role to define aggregation and privacy (as well as what oversteps the bounds of newsworthy information) in the age of sensor journalism and the Internet of Things. Or perhaps, instead of a clear code of professional ethics, or even in addition to one, journalists should agree to a “common morality,” whereby people simply have more control over their data, and we always seek to minimize harm, Culver suggests. 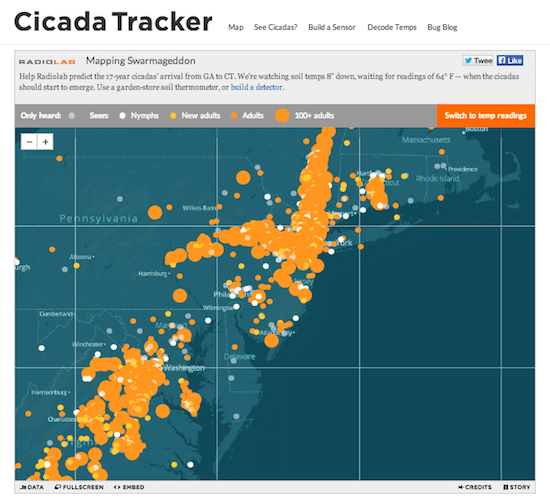 WNYC’s Cicada Project used small sensors to project when the next year’s cicadas would emerge by crowdsourcing ground temperature readings. Josh Stearns, director of journalism and sustainability at the Geraldine R. Dodge Foundation, exhorts the media industry to approach sensor journalism with a spirit of “openness and transparency,” since our audiences are still quite unfamiliar with the practice. Building trust is paramount, or the potential for sensor journalism may be compromised. While he celebrates the way WNYC’s “Cicada Tracker” project used crowdsourcing to collect data, he acknowledges that there is more work to be done on learning how to “prepare and protect the community members with whom we work” if they’re helping us collect data. Pitt’s report is a rich document that should be required reading for newsroom journalists exploring the potential uses, pitfalls and ethical implications of sensor journalism. You can explore more of it here. Angela Washeck is a freelance writer and editor based in Dallas. She is a proud graduate of Texas A&M University, where she earned a Bachelor of Arts in Communication with a journalism minor. Angela also writes for MediaBistro’s 10,000 Words blog and TexasMonthly.com, and she once interned with TV newsmagazine “Dan Rather Reports.” Her work has been republished on Editor and Publisher, the American Press Institute and more. When Angela is not busy with PBS MediaShift work, you can find her watching “How I Met Your Mother” reruns, watching Aggie football and attending indie/folk concerts in Dallas. Follow her @angelawasheck. This makes perfect sense. In an age where readers are finally tiring of superficial stories created by editors who hack away trying to meet expectations–we re-create depth. Good journalists have always looked for ways to contextualize stories with observations and research based facts. Now we will call it data provided by sensors and thankfully, we might be able to access it more quickly than ever before–to meet the 24/7 news cycle. The real test will be whether we can expand the stories a bit now and breathe–or whether the continual compression will edge out other important information. As usual, there should be no question as to how journalists handle the information. Like all research and documentation, it should be held to the same scrutiny as any source used. an invasion of privacy. They use the active denial system to make you think you are hearing voices – it has technology like the audio spotlight. Next they use Psyops like stalking, drugs, kidnapping, whatever they can to either 1) put you in a “crisis stabilization ward” or 2) a prison and steal your guns. Case by Justice Cardoza – Schloendorff v. Society of New York Hospital,105 N.E. 92 (1914 ) that says anyone of sound mind and not a criminal has a right to say what goes in their body or on their body. They want to ensure there is no way you can get this off. No one in America wants this level of privacy invasion. In addition, it allows law enforcement the opportunity to torture you at will with sleep deprivation, heart attacks and other pains. The active denial system can murder without leaving a mark! The Bio Initiative Report with 2014 additions details all the cancers, diseases and disabilities it causes. Hence, the need for Obama Care.